The hidden values in color, and color mixing basics. Where colors fall on the color wheel, and how that affects mixing. Basic color theories and changing color through the ages (how did Van Gogh get those sad violets?). Color mixing and painting methods. How to avoid mixing mud, AND how to (purposefully) mix the appropriate mud, shadows and other nasty colors. Mixing beyond the basics, including a handout containing the ultimate color mixing exercise. Cost: $225 for Virginia Robinson Gardens members and Botanical Artists Guild of Southern California (BAGSC) members; $275 for non-members. Tea, coffee and water provided. Bring your own lunch. A materials list will be supplied. Paint samples will be supplied. 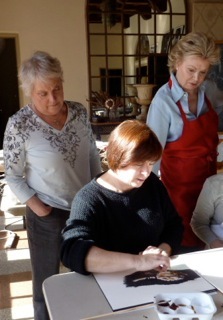 Suz Landay and Kerstin Royce look over Deb Shaw’s shoulder during a demonstration. Classes will be held in the Pool Pavilion, Virginia Robinson Gardens, 1008 Elden Way, Beverly Hills. To make reservations, visit Virginia Robinson Gardens; call (310) 550-2068; or mail a check, made payable to: FRIENDS OF ROBINSON GARDENS. Deborah Shaw has a degree in fine art from Pomona College, The Claremont Colleges, where she also studied botany and native California flora. Ms. Shaw is an active member of the American Society of Botanical Artists, the Botanical Artists Guild of Southern California, and the Guild of Natural Science Illustrators. She has taught art and botanical art at numerous venues, including The Getty; The Huntington Library, Art Collections, and Botanical Gardens; Virginia Robinson Gardens; and Bowers Museum. She taught illustration, digital design and information design at the University of California, Irvine, Extension where she was the recipient of the “Distinguished Instructor” award. Deborah’s work has been displayed in juried and non-juried exhibitions, and is in private collections. Her work is in the permanent collection at the Hunt Institute for Botanical Documentation at Carnegie Mellon University. She has received numerous awards for art, illustration, design, product design and advertising. Her preferred media include graphite, watercolor, colored pencil, scratchboard, Illustrator and Photoshop.